Stealth games have always been a part of my gaming diet. While I grew up playing the typical Mario or Sonic, they never did that much for me. It wasn't until I was shown Warcraft 2 by my friend Greg, that I saw potential in this medium. By the late 90s, I had all but been converted, due to such strong titles as Starcraft, Unreal Tournament, Planescape Torment, Sim City 3000, System Shock 2...and one other important game. Unlike most people in 1998, who were transfixed by the stealth and cinematic presentation of Metal Gear Solid 1, I was completely consumed in the world of Thief: The Dark Project. I won’t lie in saying that I didn't try Metal Gear Solid out, it had after all come out within 2 months of Thief, and met with greater sales. What I also won’t lie about, is that MGS had the misfortune of being played after Thief, and because of this I snubbed it pretty hard (you'll see later why). The last one is bold-faced, because it’s the key reason Thief stealth works so well, why it still holds up, and why it was a clear inspiration for Mark of the Ninja. The other 3 are important too, especially Thief’s masterful level design that I could gush endlessly about…but I want to focus on sound. See, most games approach sound in this rather cosmetic or surface-level fashion, where they try to give you some nice atmosphere in the background, along with basic sounds effects for your mechanics. The trouble is most noise in games doesn't propagate like it does in real-life, nor does the AI recognize this and respond to it. Now what you’re actually seeing here is a player that is about to come up on a corner. In say many third-person stealth games, even Deus Ex: HR, what you would typically do is take cover/nudge against the corner, and manipulate the camera to see up the incline without moving your avatar around it...or use some BS radar. I. HATE. THIS. DESIGN. Third-person stealth to me has almost always been a dumber experience, simply because in third-person you have this absurd super-human field of view. It doesn't just blow realism, but more importantly it gives the player this huge handicap the AI enemies don’t have. Stealth games are all about perception, and their challenge/fun comes from that. Why I love Thief is represented in this example, because in Thief you’re limited by the first-person perspective. I can’t manipulate the camera to look around the corner while my avatar is behind the wall. I could lean out, but that is still a risk of catching suspicion. Instead what I would do is simply listen. What Thief did was have sound propagate in 3d, where you could tell the direction it was coming from, it would dampen if blocked by an object or wall, and different ground materials make more sound than others. You can see wood, metal and stone marked in the example, because the player can listen and find out what materials are being walked on by a guard's footstep noise, and where the guard is positioned. Suddenly gamers that are trained so much around using their eyes, now are forced to utilize their other sense to survive. So how does Mark of the Ninja relate to this? Well I argue sound is the primary reason Mark of the Ninja has been critically well received, and its biggest innovation is how the game implements that sound. Mark of the Ninja is a 2d sidescroller game, so inherently propagating sound is never going to work realistically since a whole dimension is missing. Like any good piece of art though, Mark of the Ninja works within its constraints, and decides that it’s going to visualize all sound made by you and other people. You can see the ring formed from the dog’s howl, showing the danger the player is in. While that danger in this example is exceedingly obvious, you will often rely on sounds because your vision is naturally obscured in this game. If you’re expecting to manipulate the environment like a typical sidescroller, where you have x-ray vision into everything on screen…well don’t. Your character can only see a certain range in front of them, objects further in the distance can’t be seen if there aren't lights there to aid you, and the interiors of buildings are darkened out or completely black. Just like Thief, the use of light/shadow and level design are considerations the player must take into account, and then manipulate to their advantage. However, the key to deal with those challenges comes back to sound. If I lean against the door of a building, I can still see the rings of noise from an enemy’s footsteps as they get closer. If I need to get past an enemy, I can lure them using the noise rings my tools generate, and I need only to overlap those rings over the enemy to grab their attention. What you end up with is a game that provides all the sensory knowledge a player needs to traverse through a space undetected, but does so in a way that is both fair and challenging. It also helps the controls for this game are super responsive, and buttery smooth to use. This is one of those few games where when you fail, it’s indeed YOUR fault. 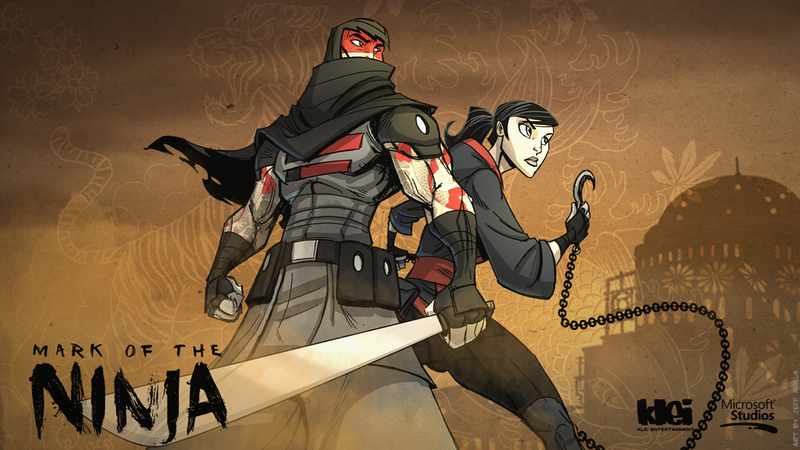 Mark of the Ninja was an experience that changed perception in multiple ways. It clearly does it through stealth in game, but it changed my perception of what a small downloadable game could be. This was the first small downloadable game, where at the end of December, it was actively fighting to be my GOTY. If Dishonored and XCOM: EU didn't exist, Mark of the Ninja would’ve won too. From a studio whose previous games I didn't much care for, suddenly came a game that wasn't just good, but the best stealth game I’d ever played since Thief 2 launched back in 2000. I know that the 2012 indie spotlight was shining heavily on Journey, but I just couldn't notice it beneath the casted shadow of Mark of the Ninja. Mark of the Ninja isn't just a hero of a video game generation, it’s a sign that this gen in particular birthed a new market of games that are just as impactful as the big guys, and just as polished too.